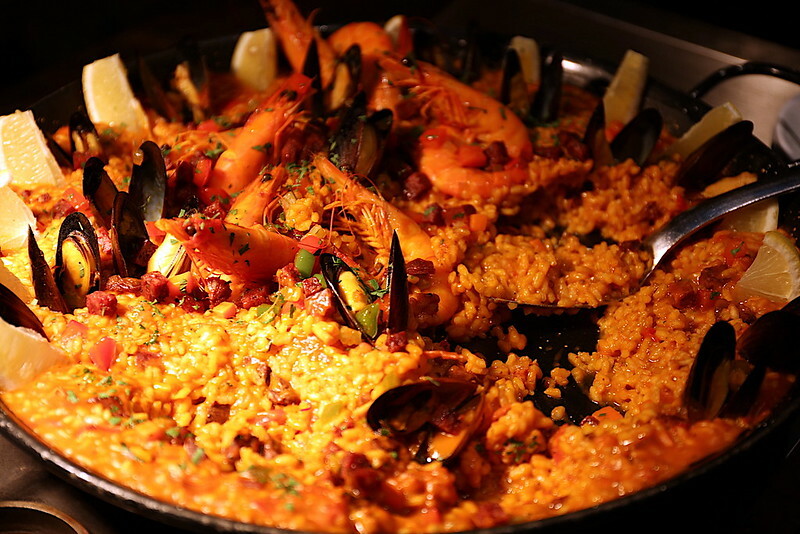 Seafood, seafood everywhere! 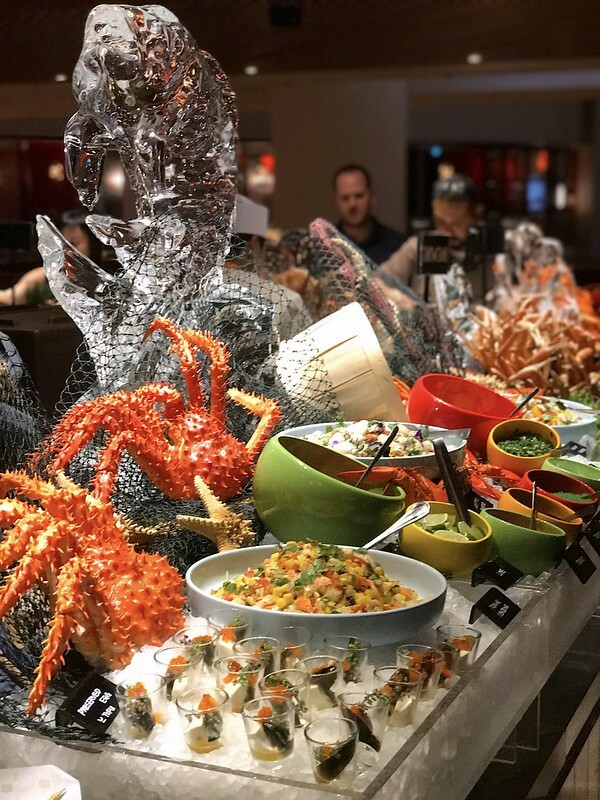 The popular Hooked@Edge Dinner Buffet every Wednesday and Thursday evening at Pan Pacific Hotel is just the place to go if you're a big seafood fan. 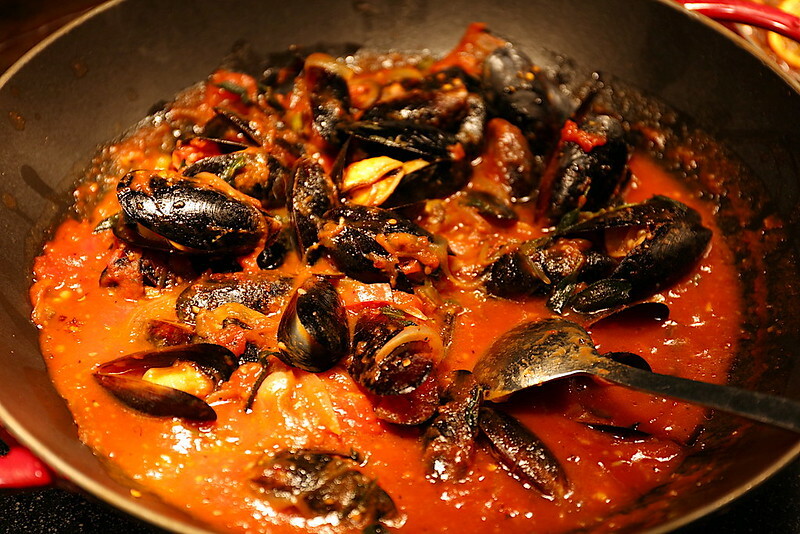 Chef de Cuisine Ken Zheng has crafted numerous dishes that convey the versatility and natural flavours from the ocean. 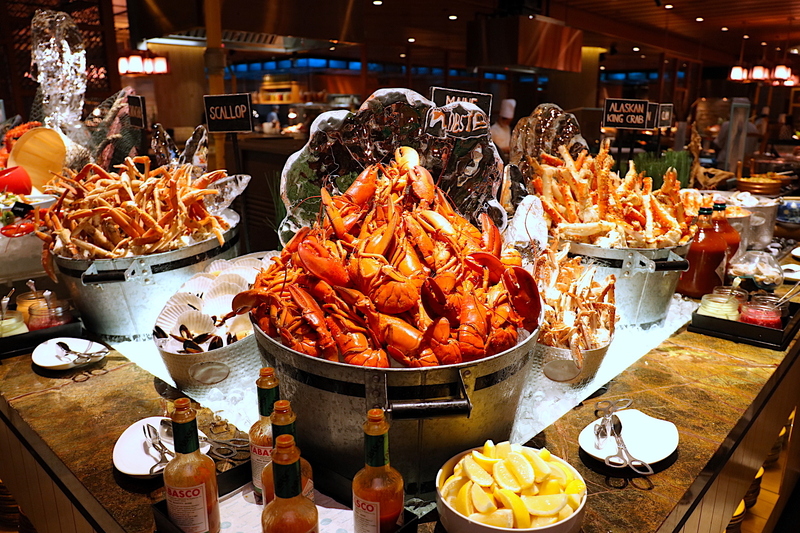 Expect a comprehensive array of crustaceans on ice including Boston Lobster, Alaskan King Crab, Flower Crab and freshly-shucked Oysters. 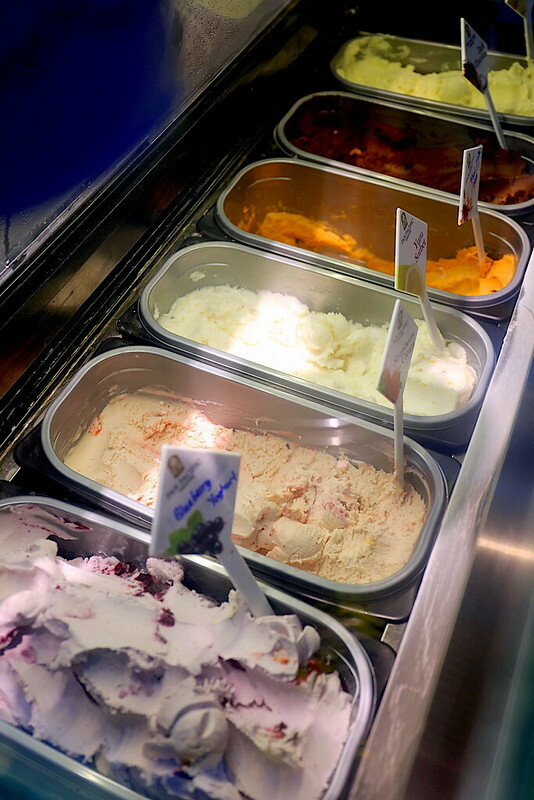 The wide selection of cold appetisers alone will keep you pretty busy. For your first pit stop, head over to the Knife Shaved Marinated Seafood Raw Bar, featuring Prawn Tartare with sweet mango chilli and poppy seeds; White Snapper with candied longan, basil, lemongrass and fresh chilli; Diver Scallops with fresh vanilla pod, kumquat and shishito pepper; and a bonus Truffle Edamame Shooter. Japanese cuisine aficionados may delight in authentically prepared dishes such as a selection of fresh Sashimi including Hamachi and Yellow Fin Tuna, Crispy Crab Maki and Ebi Furai Curry with Steamed Japanese Rice. 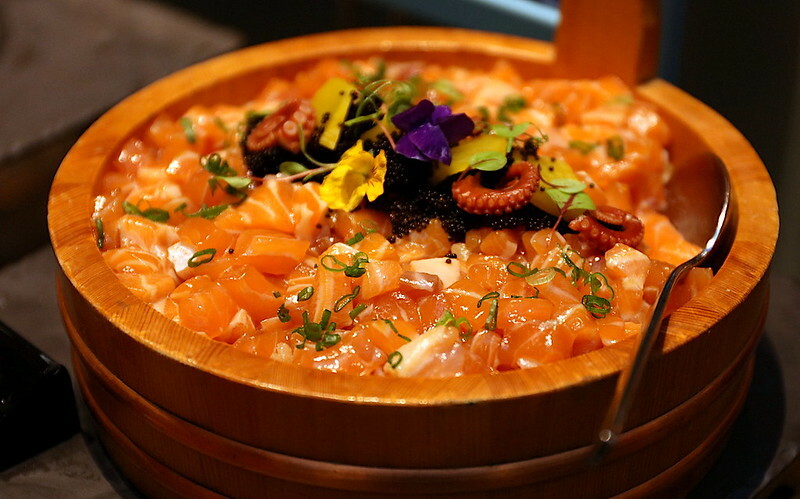 There are lots of gorgeous-looking giant chirashi tubs too, like this salmon laden one above. 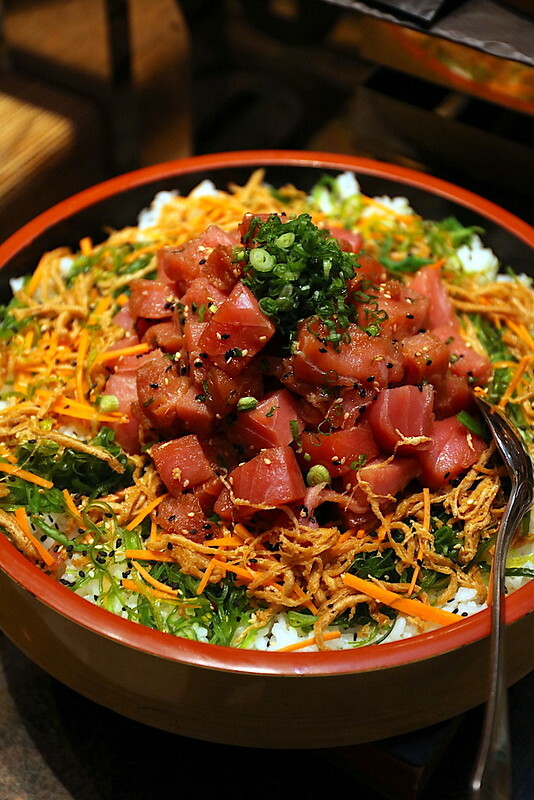 Look out for the Tokusei Ahi Poke Chirashi, comprising tuna sashimi, marinated seaweed, shredded beancurd, avocado and topped with sesame seeds. 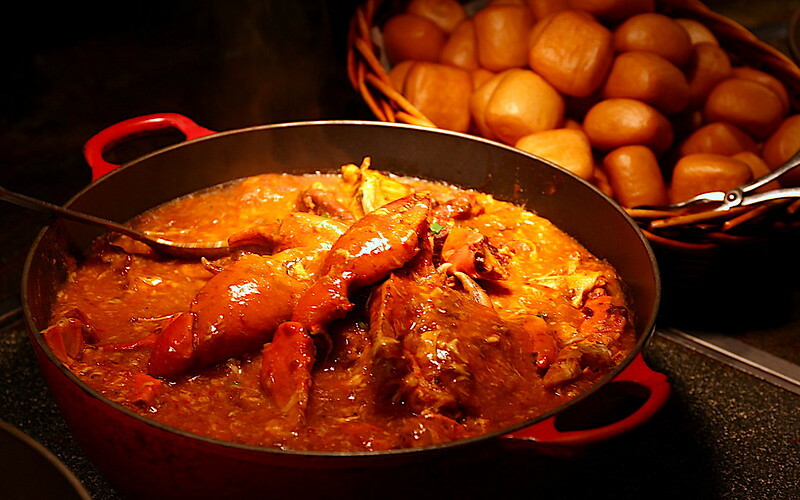 Perennial favourites of Hooked@Edge include Singapore Chilli Crab with Golden Mantou (photo above, this is good stuff), Salted Egg Yolk Crab, Edge Curry Fish Head, and Curried Crispy Baby Squid. ...and Baked Cod on Spinach Leaves with sesame seeds. 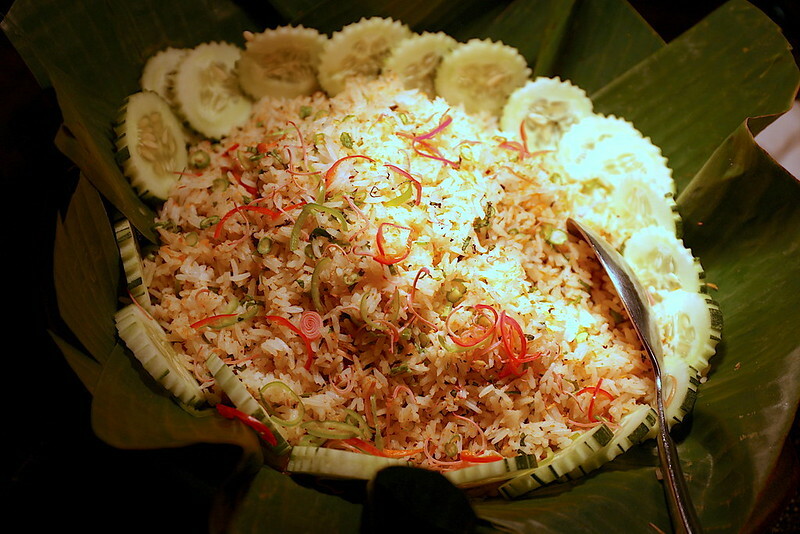 I was pleasantly surprised to see Nasi Ulam, and it's a pretty good rendition! 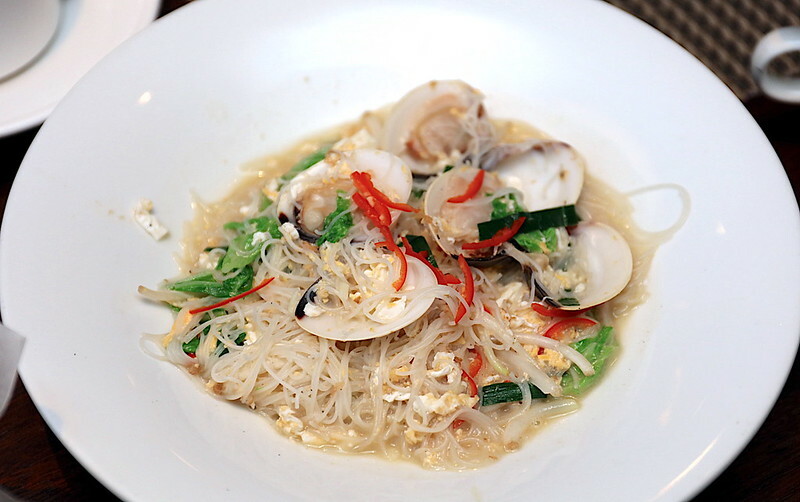 Edge has always had quite an array of interesting local and Peranakan dishes. 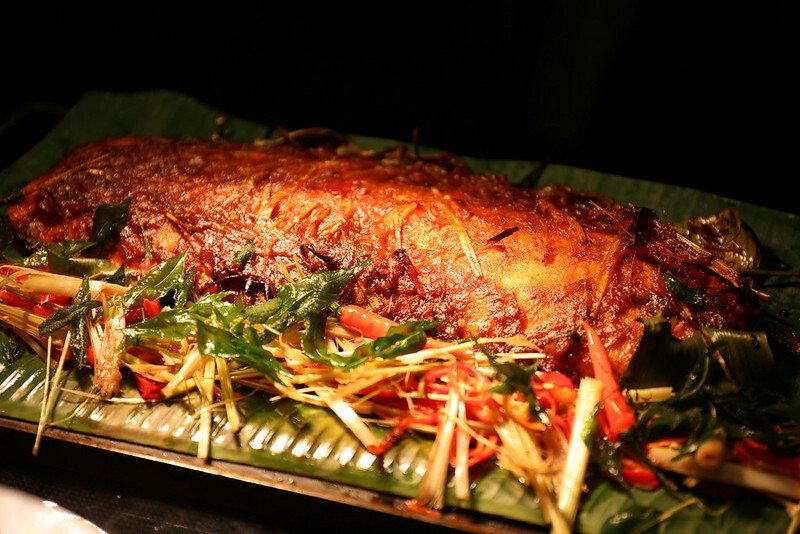 To see so many kinds - salted fish, pineapple, belachan, green chillies (cabe hijo) and red chillies - is just a step closer to heaven. Add this to the nasi ulam and it's perfect. 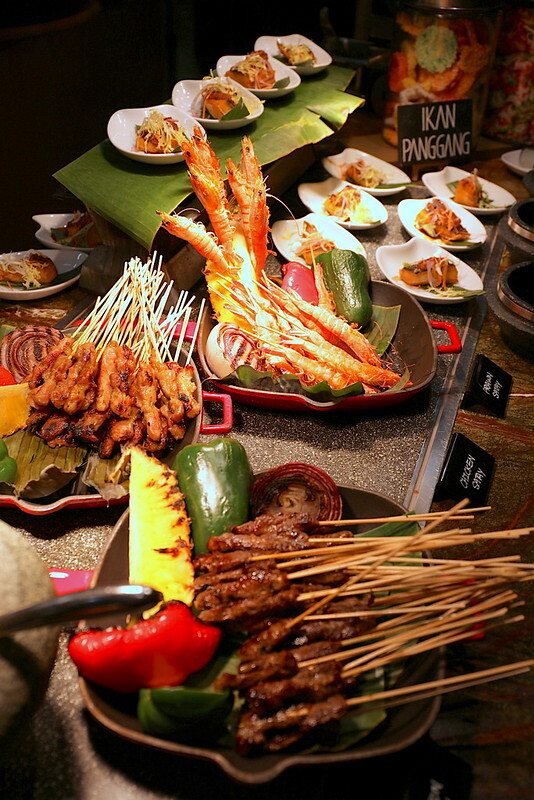 Satay with Prawn Panggang (Grilled Shrimp) with Sea Salt. Some days it may be Ikan Panggang (fish) instead. 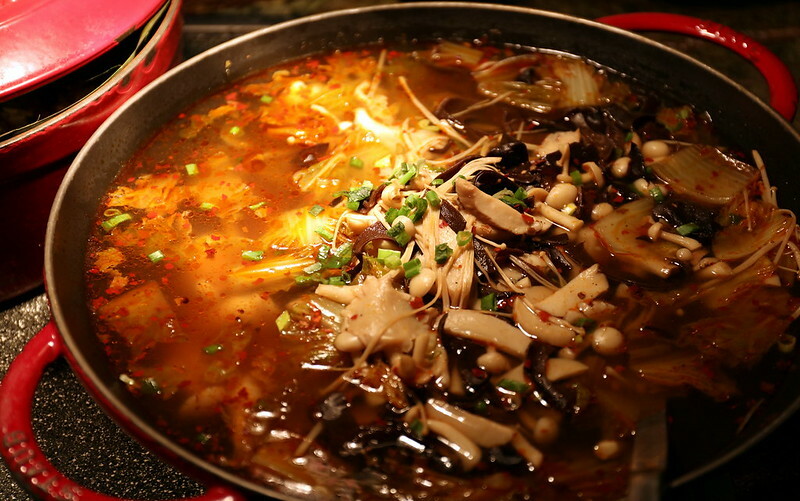 Many of the dishes are on rotation basis. Most of the time the satay is pretty good, but on the day I tried it, it was a little on the dry side. 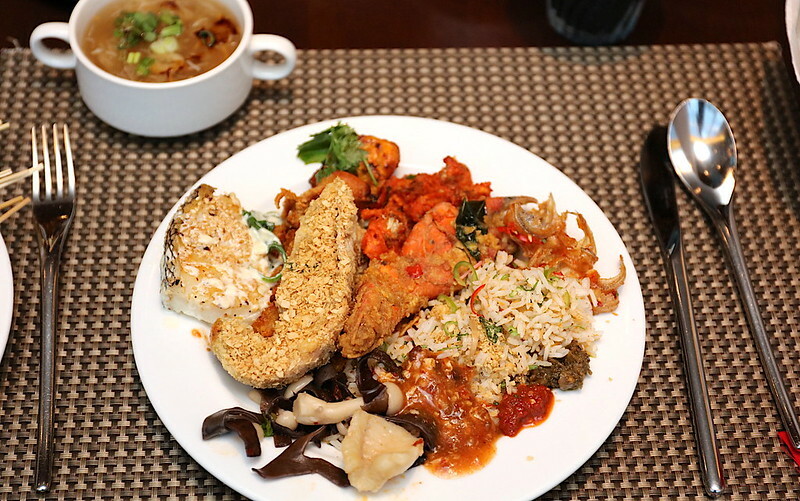 Newly introduced dishes to the generous seafood buffet spread include the delicious Poached Fish Fillet in Mala Broth (above), Oatmeal Crayfish, Nyonya King Prawn Laksa, spicy Baked Ikan Pari Sambal (Sambal Stingray). There's also Drunken Prawns with Chinese Wine nearby along with a couple of soups. 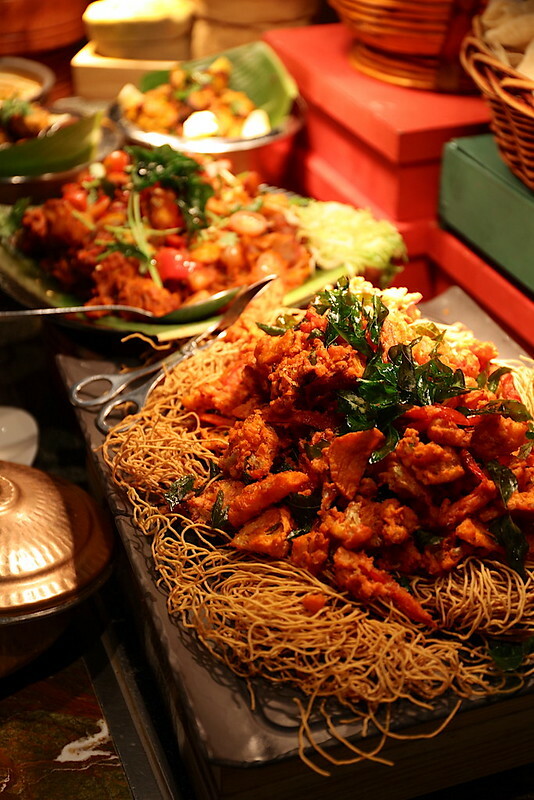 Also new is the flavourful Wok-fried King Lala Beehoon that is available at the live Wok Station. 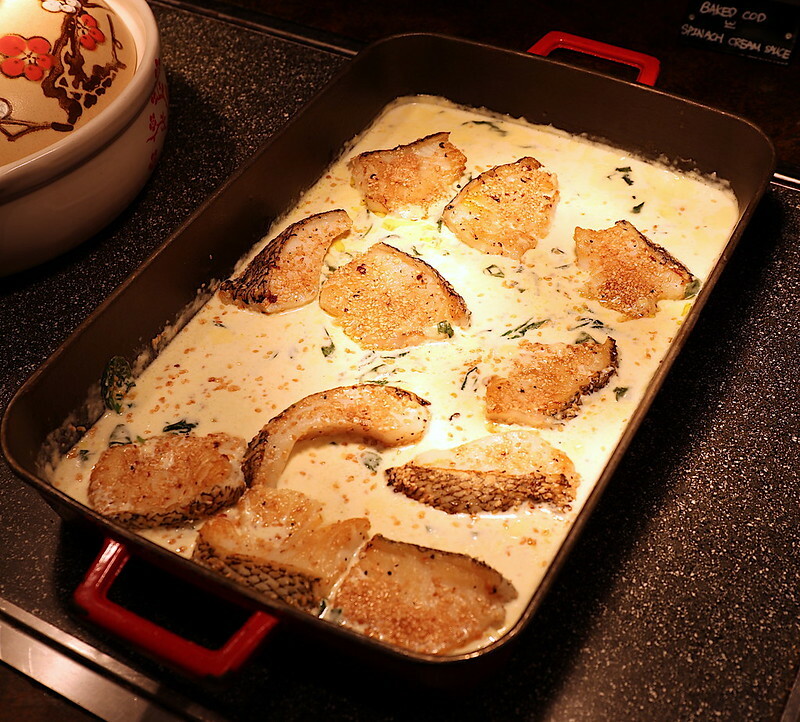 Eat this while it's hot; it soaks up all the gravy pretty fast! 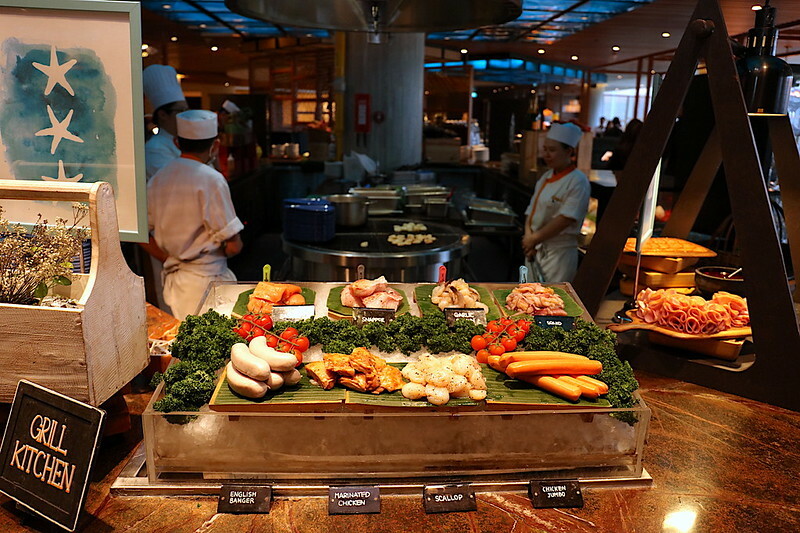 The live grill station gets a stronger focus on seafood. Take your pick from the fresh variety and have our Chefs prepare them a la minute, with choices of Hokkaido Scallops, Thai Style Marinated Squid, Garlic Prawns, Marinated Salmon Fillet and more. Pity the stellar wagyu beef is not available for this buffet. 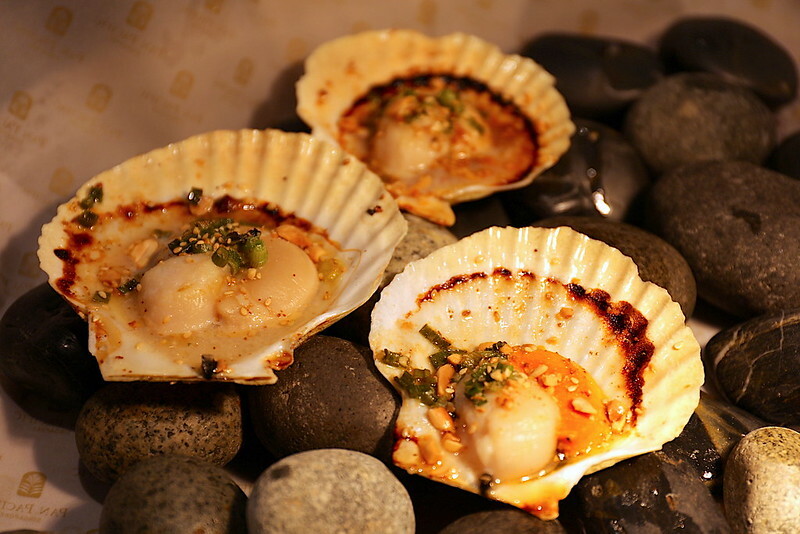 Other new creations include Baked Vietnamese Scallops with Scallion (above) and Cuttlefish Tagliolini Pasta. 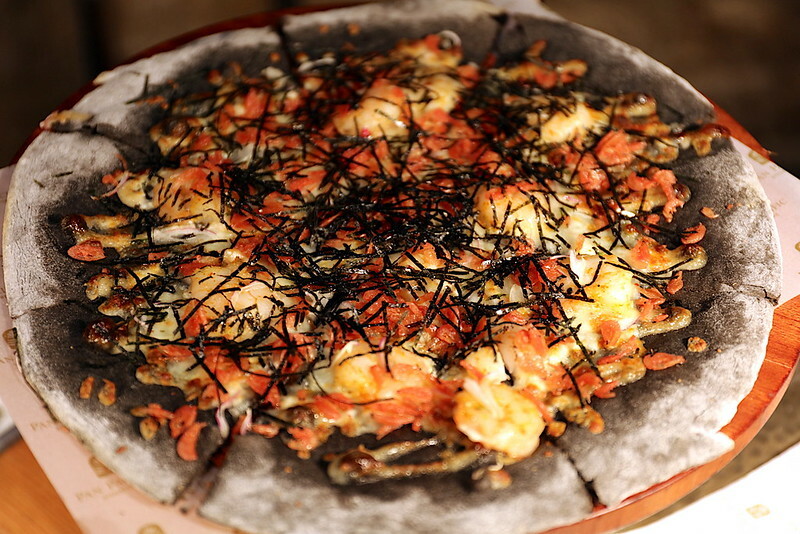 There's even a prawn pizza with what looks like squid ink! 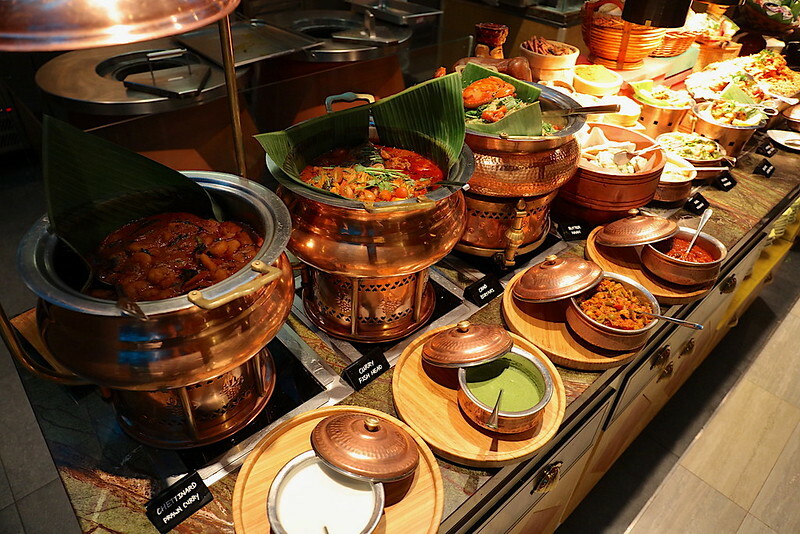 The Indian food section always looks so good. 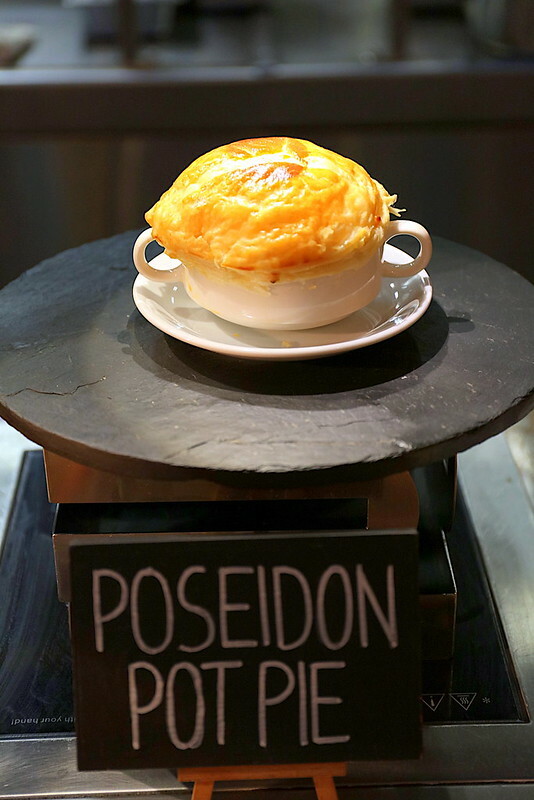 Check out the Signature Nandu Crab Biryani for a different take on the usual briyani. It's not all seafood, of course. 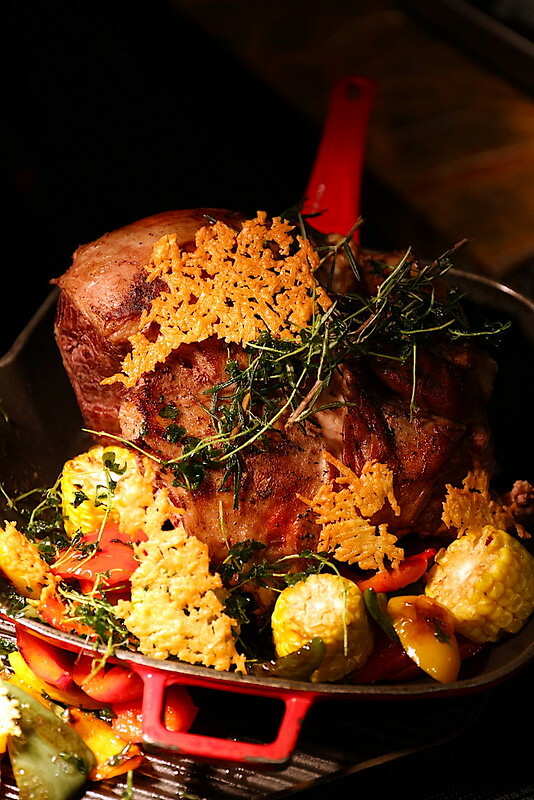 Leg of lamb gives you a break from all the crustacean overload. Even the Dessert Food Theatre gets a marine theme. Don't miss the signature Durian Pengat (located in the chilled display), Dulcey Nutty Gateau, Morella Cherry Strudel and Gluten-free Chocolate Brownies. 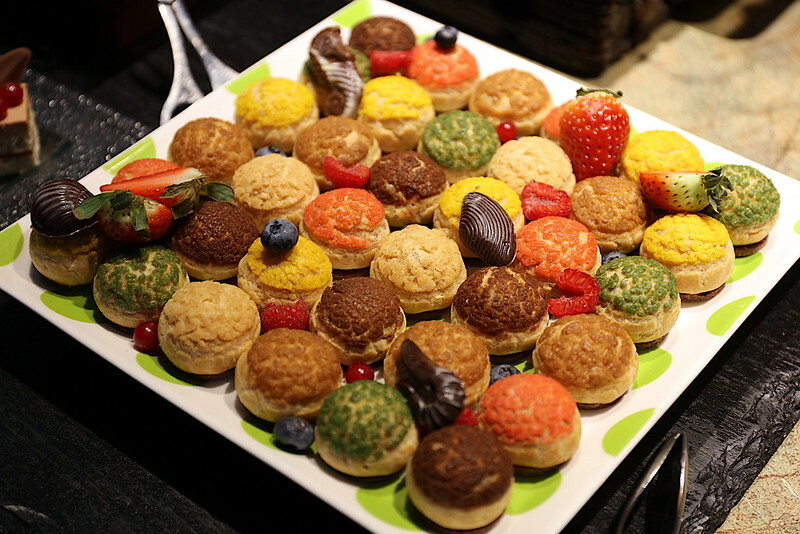 These cream puffs look so festive! But I'm really happy with the ice cream - the Thai Milk Tea one is exceptional! 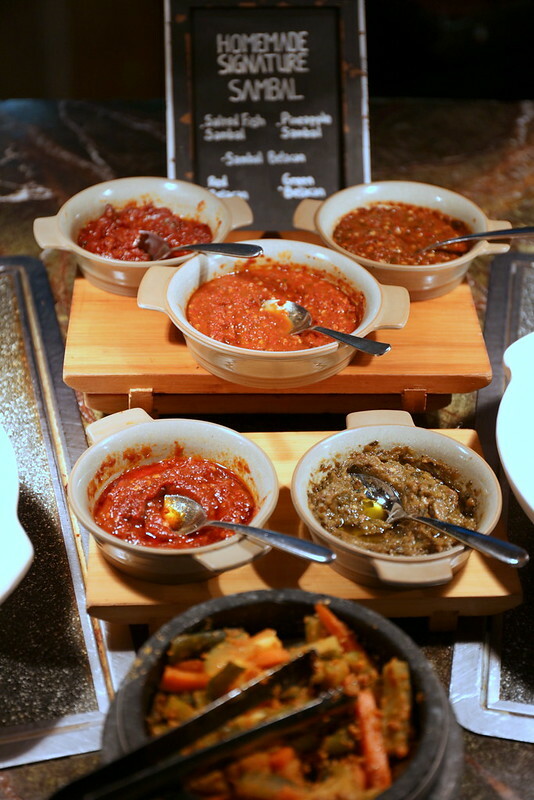 All-Day Dining Buffet’ and ‘Award of Excellence’ at the G Restaurant Awards 2016 organised by The Peak Selections: Gourmet and Travel. 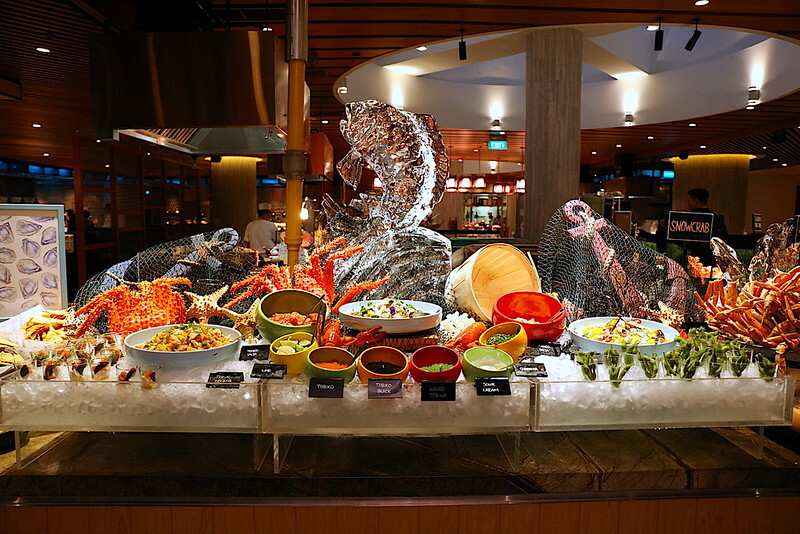 The refreshed Hooked@Edge Seafood Dinner Buffet is available every Wednesday and Thursday evening from 6:30pm to 10:30pm at Edge, and is priced at S$88 per adult, inclusive of unlimited local beverages, coffee and tea. Toast to unlimited glasses of red and white wine for only S$10* when you dine at Hooked@Edge every Wednesday and Thursday evening. *Promotion is subject to availability and prior reservation is required. Applicable for selected house red and white wine only. Not valid in conjunction with other discounts, offers, promotions and gift vouchers. Promotion is not valid on eve and day of Public Holidays, and other special occasions determined by the hotel, unless otherwise stated. 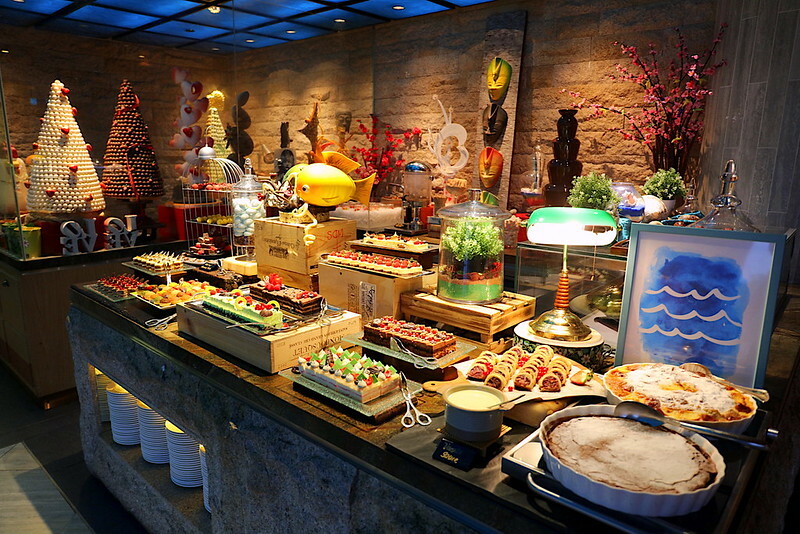 Highlighted buffet items are on rotation basis and are subject to change. Prices may vary during festive period. All prices are subject to 10% service charge and 7% GST, unless otherwise stated.